Consistency is, arguably, the most important thing in any competitive deck, and for me this is what makes Silhouette's 40 card deck minimum so attractive. At the time of writing, the only Runner with the same out of the box consistency is Chaos Theory: Wünderkind, and +1 isn't as much fun as peeking at an unrezzed piece of ICE before you face-check a remote. Time for a bit of maths. Pick a card, any card that you consider a must-have card to get your deck going - Magnum Opus drives my economy, so I'll use that as an example, but it could be anything. My ideal first turn might be to drop Magnum Opus #1, and then for 6 . If I put 2 x Magnum Opus in the deck, that's a 1/20 chance of drawing it first card, with increasing odds as I draw more cards and the deck gets smaller. With a 5 card starting hand, that's better than 1/4 odds of Magnum Opus being in my opening hand, and me playing my perfect first turn. The option to mulligan increases those odds to (roughly) 1/2, meaning that every other game my opening turn could be exactly the same. For those games when you don't beat the odds, a 40 card deck isn't too difficult to dig through - Quality Time is a cheap splash, but it encourages you to overdraw, and the last thing you want to be doing with such a small deck is discarding cards. For that reason, I prefer Earthrise Hotel - the drip style draw gives you more time to get cards out of your grip and onto the table. It's probably not a good idea to over rely on a single card for your economy, but you get the idea - out of the box (and ignoring cards like Paige Piper) a 40 card deck is significantly more reliable than a 45 card alternative. Silhouette's actual ID ability lends itself towards a cautious approach, and has excellent synergy with Security Testing, Feint, and Quest Completed. Just like when facing against other Criminal's, the Corp is likely to ICE up HQ pretty strong, so the central focused breakers (Breach, Alias, Passport) are worth considering. As I mentioned, discarding cards isn't something you really want to do with Silhouette - so caution is key. There isn't a lot of room for recursion, and you are probably only going to play with 2 copies of any given card, so even the smallest amount of net or meat damage can ruin your day. Install critical software and hardware as soon as you draw it - these cards are much harder to trash once they are on the table. Also, consider Film Critic for disarming Jinteki: Personal Evolution and Argus Security: Protection Guaranteed, and, of course, Plascrete Carapace for surviving Scorched Earth. Hard counters are mostly Jinteki, and include Psychic Field, It's a Trap!, Underway Grid and Zaibatsu Loyalty. I've always like Silhouette. As @Kikai mentioned, the 40 card deck size is rather rare and quite valuable, allowing you to get your essential pieces in play quickly. But I also really like her ID ability. Expose is an underutilized mechanic. Deck slots are tight and there is often little or no room to include an expose mechanism. And many times that is fine. You may not need it every game. But often it is crucial. I've long had an issue with Mushin. The gamble this forces on the runner has tremendously high stakes. The corporation could score a Vanity Project next turn, or do four brain damage, or eight net damage. If any of these things happen, the corp has likely just won. 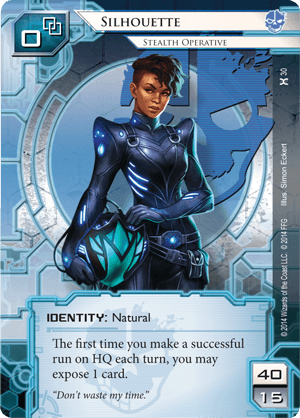 High stakes are fine; that is often what Netrunner is about. But Mushin does this for free, while saving 2 s, and most importantly, can be done on turn one. Anyway, Mushin is mostly a dead draw versus Silhouette. A few corp decks revolve around Mushin as their sole win condition, so you may get an easy win in such cases. Recent additions to the card pool have made her ability even more relevant. The biggest example is NGO Front. Glacier has become popular again thanks to cards like NGO Front and Jinja City Grid. Whether the runner takes the bait and wastes 15 s or not, the corp still profits. Knowing whether or not to commit to running at that huge server may end up saving you the game. Everyone's favorite turtle is at home in most decks, but gets a nice boost in Silhouette. You will often end up scoring two counters on a successful HQ run. I'm not sure if she is holding Blackguard or Zamba or something else in her hands, but either synergizes nicely with her ability (with Zamba being far less janky). Both cards make her ability useful even if you don't find you need the extra info in a given game. I like to use a Sneakdoor to make those HQ runs easier. Try her out. I think you'll find she does well in the current meta.